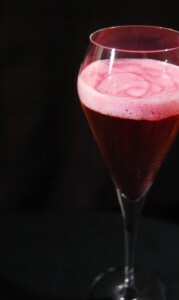 A nice and simple idea for a modern version of a traditional cocktail called Kir Royal most of the times: sparkling wine with cassis (blackcurrant liqueur) – but with blackcurrant foam replacing the liqueur. Soften the gelatin with cold water. Drain it. Melt in the microwave. Blend it into the blackcurrant juice and the sugar cane syrup. Insert the mixture into the siphon and gas twice for a siphon that contains 1 liter and once for a siphon that contains half a liter. Serve a glass of crémant or champagne and put the blackcurrant foam on top. This recipe has been created by the restaurant La Dame d’Aquitaine, Dijon, France and is displayed and kindly shared by the Cassissium.